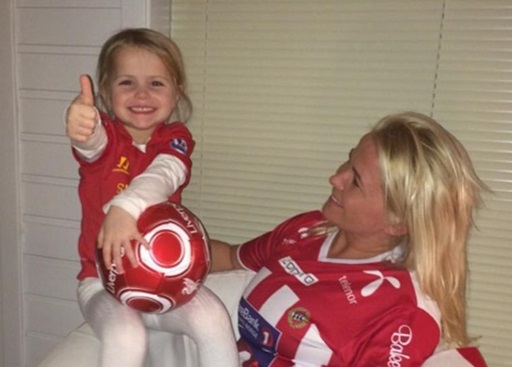 A nutty Norwegian Liverpool fan has named his daughter ‘YNWA’ – as in “You’ll Never Walk Alone”. Yes, we know what you’re thinking but Daniel Agger is Danish, remember? Speaking to Dagbladet, the little girl’s mother, Eirin Isabell Iversen – herself a Tromso fan, described how her and her lunatic husband picked the unusual name after having his first choice scuppered by Mother Nature. “I’m probably not as interested in football, but it was actually my suggestion to call her “YNWA”,” Iverson said. Apparently little YNWA’s parents gave her the opportunity to alter her name, but she opted to keep it while adding “Karoline” into the mix – meaning her full name is actually Karoline YNWA Iversen. “Her name is Karoline YNWA,” Iversen continued. With her fifth birthday coming up in May, Karoline YWNA’s dad has promised to take her to Anfield as a special treat after successfully (and none too subtly) indoctrinating her at an early age. Something something child abuse something something. If it’s pronounced Ewe-Na. Then its not the worst name in Norway. It’s her middle name, she doesn’t even have to use it (well, apart from on official documentation). Is it really any worse than some of the names given to kids by rock stars & movie stars? Not that I’m condoning the irresponsible naming of children, but each to their own. It’s their kids, not ours. How is it pronounced? Yunwa? Inwa? The young one is lucky her dad wasn’t a West Ham fan.